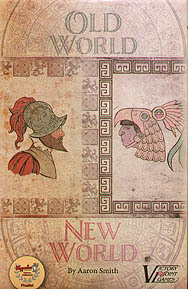 In Old World New World you take command of explorers trying to find their destiny in a recently discovered land. The map is revealed as you play against up to three opponents, with each of you trying to shape the land to best benefit your own side. With player controlled events such as Barbarians, Tornadoes and Bribery, no plan goes unhindered and anyone could find themselves mapping their own destiny!